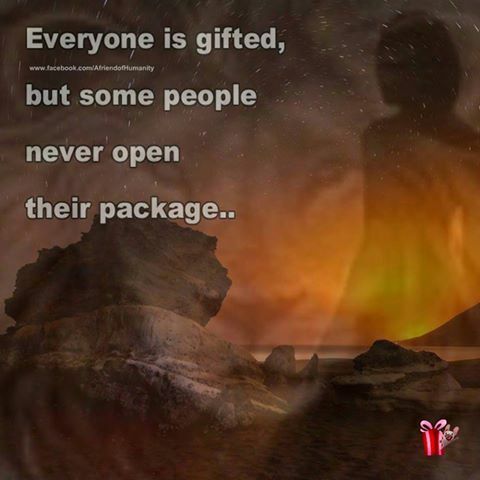 If I asked you if you thought you were gifted, what would you say? Uncertainty might creep its way in, and you might not know how to answer. It is not unusual for us to get uncomfortable when we are asked direct questions about ourselves. Why do you think that is, why do we get embarrassed or uneasy when the focus turns to us? Do you remember hearing when you were a child – ‘don’t speak unless your spoken to’, ‘children should be seen and not heard’. All of what we absorbed as children from our parents, teachers and society, conditioned our minds to believe it was the ‘truth’. From that constrained way of thinking, we came to believe that expressing something about ourselves perhaps insinuates that we were vain, or self-centred. Questions frankly asking us about ourselves, certainly for many, makes us anxious. We would much rather talk about someone else than have any attention drawn towards ‘me’! The real truth is, we are all talented human beings. Each and every one of us is here to fulfil a purpose. The expansion of our Soul is why we are gifted life experience after life experience. With each reincarnation we move closer to our divine resolve. As we move and make our way through the process of our life, there is a firm determination within us. Each day we solve and settle, putting things right so that we feel strengthened in our commitments, ambition and motivation. In other words, we do what is expected of us and what is necessary. Taking care of others, fulfilling our daily obligations and hopefully with a little time left over, taking a little care of ourselves too. All of this daily real life stuff is great, if you don’t weaken. What many of us don’t make time or room for in our life, is nourishing the greatness that exists within us. Making a connection to ourselves on a deep inner soul level is often avoided because we are so occupied with the business of our lives. Who has time to stop and smell the roses these days!!! But that is exactly what we need to do, hurry up and slow down. How are you going to get to know yourself if you don’t take an interest? So, let me ask you one little question that might make a big impact – What gift do you hold inside of your ‘self’?